Liners can "Jump the Track" or fall out of the track for various reasons. These include improper fit of the liner, corner stress, liner shrinkage, stressed or expanded liner tracks, water behind the liner, etc. 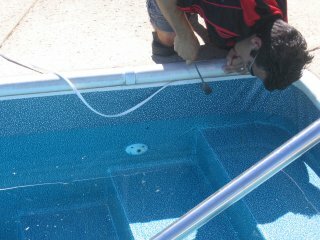 This can be a huge hassle and can even cause damage to your pool or liner. Luckily, T-Lock is a simple and effective fix to this problem. T-Lock (or bead lock) secures the liner bead into the track. T-Lock is pressed directly into the track into the thin void directly above the bead and prevents the bead from coming out of the liner track. T-Lock is easy to install and works on all track and bead systems. To view T-Lock prices visit our Order T-Lock page. Tapping the Liner T-Lock into place.